The inaugural Craft Content Nashville is almost here! The doors open at 8 a.m. Saturday and our keynote begins promptly at 9 at the Nossi College of Art, 590 Cheron Road (near the intersection of Briley Parkway and Ellington Parkway). In preparation for the big day, here are additional details on how CCN15 is going down. Check out the session schedule for the day on the homepage of our website. We’ll also have printed programs on-site … and a downloadable version (PDF). If you missed registering online, you can still come to the event! 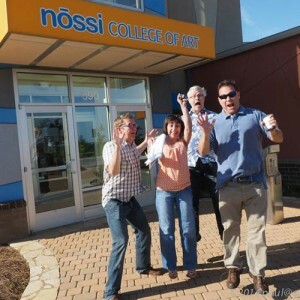 Just register once you arrive at Nossi, and you’re all set to go. What’s the Schedule for Saturday? The session schedule is now available, so check to see where your desired sessions are located and when. Allow plenty of time to check in at registration. Speakers – Please let our registration volunteers know who you are when you check-in! The doors open at 8 a.m. for late registration, check-in, and early networking. We’ll have a short time of orientation and announcements at 9 a.m. in the gallery area. Our keynote speaker, John Michael Morgan, will begin his presentation at 9:10. At 4:20 p.m., after the final session of CCN15 has concluded, we will gather once again in the gallery for a brief wrap-up of the day’s events … and then move into Studio A for the official CCN15 After Party. Sessions are 35 minutes long with a 10-minute break between each. We’ll take a little longer break between sessions around lunch time. Will There Be Working Space? If you’re a blogger or an artist, we have workspaces available for you, too! No RSVP required. Simply find a space in the workrooms and start creating! What Should I Bring or Do Day Of? The official event schedule and program will be available as a download here on the website … so print one out or have it handy on your mobile device for following throughout the day. Make sure your smartphones and other electronic devices are fully charged for tweeting, texting and blogging. Bring lots of business cards to hand out. A small notebook will be nice for note taking if you’re not using an electronic method. Wear COMFORTABLE shoes. Some extra popular sessions may be standing-room or floor-seating only. Plan accordingly! Got all that? Most importantly, have fun! We look forward to seeing you there!